I love barbie badge in white with black text and a big red love heart. 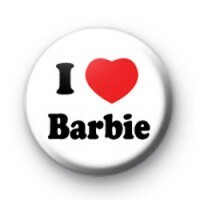 If you love barbie dolls this is the perfect badge for you. Ideal for all the barbie girls. Standard 25mm button badge hand made in our UK workshop. We have a few barbie themed badges so be sure to have a search.